Some of the most popular attractions funded by the National Lottery are to lead celebrations marking its 10th anniversary. The Eden Project in Cornwall - which received £53m from the lottery - will turn a lake into an ice rink for the first ever National Lottery Day. The Tate Modern on the banks of the Thames will be transformed by a lighting show on that day, 6 November. Lottery organisers hope the events will remind people of good causes it funds. Camelot and the lottery's grant-making bodies are also keen to thank loyal customers by opening up free of charge for the occasion some of the projects they have funded. Lottery ticket sales have picked up over the past year after several years of decline. BBC media correspondent Torin Douglas said the celebrations were an ideal opportunity to show how the £16bn raised so far by the lottery had been spent. Stonehenge will be open free of charge and there will be free tickets to events in Cardiff, Glasgow, Belfast and other towns and cities that have benefited from lottery funding. 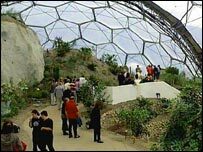 The Eden Project, which is estimated to have generated £500m for the region since it opened, will also turn one of its glasshouses into a giant Arabian tent. Among the lottery-funded projects which have proved less of an instant success are the Millennium Dome, Millennium Bridge and Glasgow Science Centre Tower. 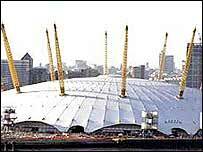 Although the Dome attracted more than six million visitors to Greenwich, its finances were based on 12 million visits and organisers had continually to ask for more lottery funds from the Millennium Commission. The Millennium Bridge - dubbed the "wobbly" bridge - over the Thames had to be closed for more than 18 months while engineers carried out modifications to make it more stable. Meanwhile Glasgow's tower, the tallest free-standing structure in Scotland, was closed for more than two years because of technical problems. And setbacks continue to plague a lottery-funded project to restore historic thermal spas in Bath for public bathing. More than £1.3bn of National Lottery money has been invested in buildings and environmental projects overall. A special draw will be held to mark the lottery's 10th anniversary in November. "The lottery has funded some startling projects"